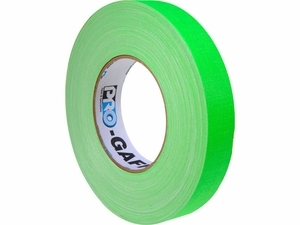 Pro Gaff is a high strength vinyl impregnated cloth tape with a matte finish, available in 4 fluorescent colors. Pro Gaff has a high performance adhesive system and is highly conformable to irregular surfaces. Pro Gaff is waterproof, abrasion resistant, and has a smooth, controlled unwind, and is hand tearable.